Are you new to the world of budgeting and not sure where to start? Well, friend, your search across the great expanse of the internet just ended, because we’ve put everything you need to know about budgeting in one place! Our hope is that you’ll see the budget for what it truly is: an easy approach to total life-change! A budget is a tool that helps you track your finances—it’s a detailed plan of your income and expenses for a given time period. Simply put, a budget is a plan for your money. Without a budget you’ll earn money and spend money. You might even save money. But you won’t tell your money what to do, and inevitably, you’ll watch as it passes through your fingers. Creating a budget puts a stop to mindless spending by bringing every dollar you make to the forefront of your brain. And when that happens, there’s nothing you and your money can’t do! Before we talk about what a budget is, let’s talk about what it’s not. Keeping a stack of receipts at the bottom of your purse does not equal budgeting. Neither does paying your bills on time (although you should definitely do that!). We don’t even count making a plan for some of your money while neglecting the rest. If you’ve tried any of the above tactics and they didn’t seem to make a difference, there’s a good reason: You weren’t actually budgeting. In a way, you were freestyling. Powerful budgeting—budgeting that changes everything—includes . . .
A plan that’s written down or stored digitally. A plan that’s created before the month begins. A plan that accounts for every dollar you’ll earn. A plan that gives every dollar you’ll spend a name. Pretty approachable, right? Don’t worry if you’re still a bit overwhelmed or confused—just keep reading! So why should you add one more responsibility to your already busy life? The effort required to create a budget looks kind of like the habit of a weekly meal prep. You put in a little work on a Sunday afternoon to get a whole week of pre-portioned lunches and almost-made dinners. Budgeting takes a bit of work up front but provides a whole month of rewards. You’re looking for peace of mind when it comes to money. You’d like to take control of your finances. You’re ready to reach your financial goals. As we mentioned, a budget is a written plan that accounts for every dollar you’ll earn and every dollar you’ll spend. Consider how different that definition looks from your current approach to money. If you’re in debt and unable to keep up with all of the mounting bills: A budget enables you to prioritize your payments and take action toward reducing debt. When you know what’s coming in and what’s going out, you can proactively reach out to bill collectors to make payment arrangements for what you owe. If you have credit card debt and are living paycheck to paycheck: A budget lets you know exactly how much money is going toward debt and allows you to start a debt snowball. That way you can pay off debt fast, so you can not only start living now, but also saving for the future. If you’re out of debt but living paycheck to paycheck: A budget encourages you to find extra money—cash you might be throwing away without even realizing it—and put it toward building an emergency fund or saving for large and unexpected expenses. If you’re living the good life with an income that’s more than enough: A budget inspires you to make the most of your money. Maybe you’ll pay off your home early, take a dream vacation with the whole extended family to Hawaii, or give generously to people in need. The monthly budget, practiced year after year, acts as the foundation that supports everything else you want to do. Yes, everything. You know what that means? Total financial freedom! Ditch your day job for your dream job. Live where you really want to live. Leave a legacy your mom would be proud of. Which Budgeting Method Should I Use? If you want to make the most of your money, you need to start at zero. Sounds weird, we know. But a zero-based budget makes sure you give every single dollar a job to do. Pretend you’re counting calories for the month. Now make note of only the foods you eat at mealtimes. Don’t include mid-morning treats, afternoon snacks or late-night desserts. Sounds like a fun way to count calories—but not an effective one. Some people apply this thinking to their monthly budget. They make note of the big stuff—like a mortgage payment and utility bills—but pretend other smaller money matters don’t matter. You choose up front and on purpose where you want your money to go. In fact, many budgeters report finding money the first—yes, the first!—time they create a zero-based budget. Think about it: One month you’re tossing cash around on toys your kids play with once, a shirt you don’t even like anymore, and snacks you definitely ate but maybe shouldn’t have. But the next month you eliminate all that mindless spending, and you have $75 to put toward that living room couch you thought you’d never be able to buy. A pretty empowering feeling, if you ask us. And all thanks to a zero-based budget! How Should I Get Started With Budgeting? We’ll assume this question implies intent. Bravo! You’re doing it! Welcome to the rest of your life. We’re so excited to help you get moving in the right direction with your money. Let’s dive on in! If you find yourself guessing on some of the numbers, that’s totally okay! The more you practice budgeting, the better you’ll get at estimating your income and expenses. 1. Budget before the month begins.For example, you’ll work on your May budget the last week (or so) of April. 2. List all income for the month ahead.Include regular paychecks, bonuses, and money from side jobs or gifts. 3. List every expense for the month ahead.Include giving, saving and spending. Don’t forget bills, debt, memberships, food, clothing, gas, entertainment, and anything else you might spend money on. 4. Move money around until income minus expenses equals zero.Maybe you’ll reduce your entertainment spending in order to increase your savings, or perhaps you’ll reduce your restaurant spending in order to buy a new pair of sandals. Keep moving things around until you have a plan that works for you. That’s it! You’re officially a budgeter. Guess what? If you followed our guidelines above for creating your first budget, you already made a zero-based budget. Go, you! But let’s take a moment to break things down a bit more. A zero-based budget means your income minus your expenses equal zero. 1. List your total monthly income. Use EveryDollar and we’ll do the math for you! 2. Start with fixed expenses and regular bills. When you input these into EveryDollar, you should see how much money you have left to budget at the top left corner of the page. 3. Add in variable expenses. Think groceries, entertainment, clothing, and more. 4. Don’t forget about giving, saving and paying off debt. Once you get the hang of zero-based budgeting, we recommend prioritizing your budget in the following order: Give, save, and then spend. 5. Look for the green checkmark declaring, “It’s an EveryDollar Budget!” When you see that checkmark you’ll know you’re officially a zero-based budgeter. Good job! As you work toward zero, be wary of the miscellaneous category. We love this line item for when your baby runs out of diapers again, or when you and your spouse decide to grab a new patio umbrella while it’s on sale. But you shouldn’t be piling up the numbers just to hit zero. Make sure you’re really okay with the amount you’ve allocated to miscellaneous to make sure you’re not overspending. Want to take your budget to the next level? You know you do! Work your way through the budget tips below. And as you do, get ready, because you’re about to experience a serious money makeover. 1. Get your budgeting percentages right. Keep in mind that your budget percentages will change as you pay off debt or earn more income. Treat this list as a guideline, not a hard and fast rule. Grab your calendar and circle one Sunday each month (or whatever day works for you). You and your honey (or your accountability partner) have big plans! In just one conversation a month, you can cover the basics and beyond. Talk about your financial goals, plus the details of your upcoming budget. Dream, discuss and make money decisions. When you budget with your spouse, you’ll both bring unique strengths to the table and (we have no doubts about this one) you’ll grow closer together as the months move along. 3. Stay motivated to budget. Budgeting is no get-rich-quick scheme. It’s a lifestyle. In the coming months and years, you’ll enjoy moments of big payoff along with seasons of the budgeting doldrums. Stay motivated toward reaching your big money goals by developing healthy budgeting habits and by filling your ears with stories of others’ success. 4. Make adjustments to your budget. You’re a professional budgeter now, so you’re already tracking your spending. But what should you do when you totally blow your budget? Easy! Make an adjustment. Let’s say you went out to dinner for a friend’s birthday. The whole table split the bill, and it’s a bit more than you planned to spend. In fact, it wipes out your restaurant category for the month and then some leaving you with a $25 deficit. No worries! Pull up your budget and look around until you find a spare $25. You may need to pull from multiple categories or sacrifice spending on new clothes until next month. Make note of the change in your budget and proceed in peace. A budget is a plan for your money. When you track your spending, you’re simply making sure the plan works. Keep your receipts and track spending by and entering your transactions into your budget or in EveryDollar. First things first—acknowledge that today you’re a novice budgeter, but in three months you’ll be a know-it-all. The time in between might feel a bit challenging. And that’s okay! Recognize this now, and you’ll be better prepared to stick with budgeting when new frustrations come your way. In the first month, you’ll probably have a flop or two (or twenty!). Again, that’s okay. Keep in mind that past knowledge helps you plan for future success. A big part of your job in the first month is to make note of all the numbers: What did you predict accurately? Where will you need to make adjustments? Use that information to help you plan better for the upcoming months. Evaluate and reevaluate your spending amounts. Get specific with your line items, perhaps breaking the clothing category down by family member or entertainment category into separate lines for date night and family fun. Look for opportunities to save more money and prioritize money goals. After the first three months, you’ll have three budgets under your belt. So now you have a handle on money coming in and money going out. And any “extra” cash you’ve found along the way can help you crush your money goals. Maybe you’re reading through this handy guide and thinking to yourself, Sounds great . . . on paper. After all, not everyone enjoys a predictable income and predictable expenses, month after month after month. Not to worry, friends! We’ve got you covered. Determine the lowest possible income for the upcoming month by looking at what you’ve brought in over the last few months. Budget according to that number, covering your necessities first and then your wants. If you make more money than planned, add the extra income to your budget. Be sure to give every extra dollar a name by working toward zero again. You might also want to start a special fund to set aside money during those months of plenty. That way you’ll have extra help to get you through seasons of not-quite-enough. The best way to prepare for unexpected expenses is to expect them. In fact, you might as well call these expenses overlooked. Count on your roof leaking during a monsoon, the car breaking down on the way to grandma’s house, and your kid growing two inches the week before he starts high school. Make a list of possible unexpected or overlooked expenses. Estimate the cost of each expense. Decide how much money you’ll put toward each expense month to month. Designate a line item in your budget for each expense and create a fund in your budget. With a fund, you’re ready for any unexpected expense life might throw at you. Budgeting for unexpected expenses protects your emergency fund from being used on Johnny’s new pants. Save that cash for more important things, like the first time he backs into your car with . . . your other car. Time for a disclaimer: When it comes to declaring the best budgeting method around we’re pretty biased. It’s going to be EveryDollar for the win every single time. We’re not just creators and support staff, we’re users ourselves. We believe wholeheartedly in the power of a monthly budget. Even more, we think a budget should be simple to create, manage and maintain. You could go old school and create your budget on a yellow legal pad, in a spreadsheet, or with an expensive software program. Or you could go ahead and join us—and more than 4 million other folks—who’ve signed up for EveryDollar (so far!). Can be accessed from your phone, tablet or computer. Allows you to create your budget in just minutes a month. Guides you through the process with suggested categories and percentages. Encourages you to build long-term goals right into the budget. Does the math for you—no calculators or pencil erasers needed here! Helps you track your spending as the month moves along. Accounts for every dollar: Hey, it’s right there in the name! Get ready for a too-good-to-be-true moment that’s shockingly true. Each of the above benefits are offered to you free of charge! You may also choose to upgrade your account to EveryDollar Plus. 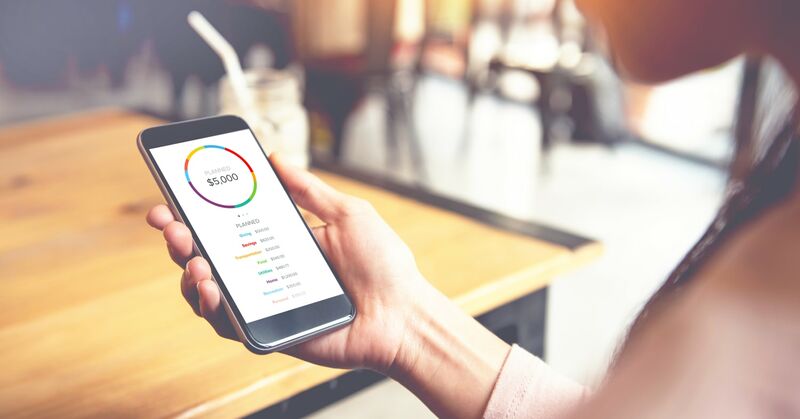 The premium version of our budgeting app connects the budget to your bank, so you can track spending with a simple drag, drop and done! Is the EveryDollar App Safe? We take data protection seriously. That’s why we encrypt your information and store our technology infrastructure in a world-class, highly secure data center staffed 24/7 by trained professionals. Add a new budget group. Change the name of a budget line item. Move categories up and down. Select budget items as favorites. Get specific and make your budget work for you. We’re thrilled to have you with us on this journey to a totally changed life! Get moving in the right direction today by signing up for EveryDollar. Have questions about budgeting? Join our community of budgeters on facebook or twitter!